There are still some seats open for the Chad Johnson/Alex Lafkas Streamer Class on January 23, a great way to get a taste of White River style streamer fishing, without shopping for new rods/lines: though we can’t guarantee you won’t be smitten with streamer fishing and shopping afterwards. 9.30-4.30 $110 8 people max. This is a class best for advanced tyers. Kelly Galloup’s 1999 book on modern streamer tactics ignited a movement and he remains at the forefront of streamer design. Kelly’s class on January 24 will be focusing on some of his new patterns released this winter and which will form part of his new streamer book due to be published in 2016. A full day with the Godfather of Modern Streamers, learning his latest patterns and techniques. Kelly is always super-informative and loves sharing knowledge. He remains at the forefront of streamer design, with a host of new patterns being released this season. Take the class stay ahead of the game. Bring your own vice, light and tools. Materials included. Michael Schmidt, of Angler’s Choice Flies, supplies a big proportion of our custom streamers, and is legendary in the business for his speed, consistency in tying and the all-around fishiness of his patterns. Michael’s 2 classes will be held on January 30, ahead of our celebration of all things good and streamery _ the annual Streamer Lovefest. Michael Schmidt is the hottest production streamer tyer in the country. We are constantly amazed at his consistency and technique churning through our orders. Schmidty knows his way around an articulated fly. Learn to tie some of his best patterns and how to tie them right time after time. The 6/7 Weight Articulation will include smaller patterns the Red Rocket and Meal Ticket. The 8/9 Articulation class will include the Double Deceiver, Voodoo Squatch, Junk Yard Dog, and potentially a demo of the Drunk and Disorderly DDD. THE ULTIMATE gathering of the streamer clan. PHENOMENAL TYERS, AWESOME GIVEAWAYS, KILLER FOOD & PHENOMENAL FUN. 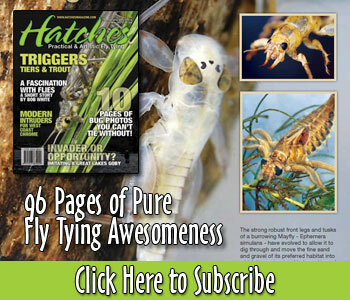 A celebration of big flies, big rods, drift boats and of course BIG brown trout. Tyers including Galloup, Schmidt, Johnson, Lafkas, Brian Wise, Steve Dally, Jeff Trigg, Chris Franzen & Matt Bennett. The Lovefest starts at 6.30 pm. As well as the tying classes we will have the Sage-RIO crew setting up their trailer at the front of the Store for the “Feel The Difference” Event: where you can check out the new Low Stretch fish hooking streamer lines, the world’s strongest tippet and the Sage lineup of streamer sticks. We will also have representation & giveaways from Rainy’s Flies, Umpqua Feather Merchants, Montana Fly Company, Flymen Co and more.